Like most wargamers out there, I'm always on the lookout for interesting bits and shapes for future use in terrain building. This often results in stockpiling various items the loved ones we live with tend to regard as 'junk' and are likely to throw out when we're not looking. All this with the idea in mind that someday, this particularly shaped piece of plastic or polystyrene might form the centre of a chieftain's great hall, a ruined temple or the hull of an advanced spacecraft. Most of the time it never leaves the state of raw material. 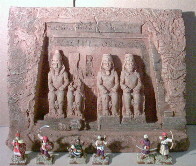 Most (but not all) of the items that attracted my interest were Egyptian in theme, which is great, because they can be used in conjecture with Egyptian styled undead and with my Fantasy Arabian desert warriors (who will be posing in most of the pictures). 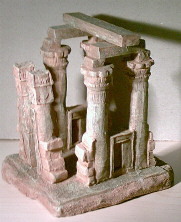 One of the best models I found there is the excellent temple to the right, which requires no additional work whatsoever and can be used straight out of the box. (Except that there was no box to begin with.) Clicking on the images will open a gallery of pictures for each model. Two of the others, although they can very well be used as is for the moment, will require some additional effort since the backside is not textured. The front part is however too good to pass up and it shouldn't be hard to incorporate them in a rocky surface for a couple most impressive terrain pieces. 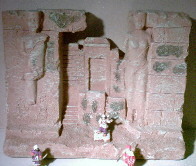 The first is clearly based on Abu Simbel, while the second was labeled as inspired from Luxor. Both will make for grand terrain with a minimum of work. 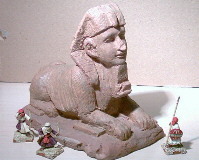 The least impressive (and also the cheapest) model of the lot was the sphinx. I say least impressive, because it is clearly not as well made as the others, but it's size alone still makes this a rather imposing model. And no tabletop desert could go without one. The final model is a natural rock formation that will serve a number of purposes, although I'll primarily use it for Wild West scenery. 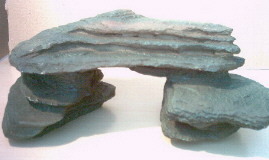 This model looks like real rock, feels like real rock, but is actually hollow inside and not as heavy as actual stone (although none of the discussed models are lightweights). So, this concludes our little gallery of fishtank scenics for now. Prices for these range from Euro 4-5 (about £3) for the small ones to Euro 7-9 (£5-6) for the large pieces. Now, I'm not saying that your local petshop will stock the exact same items, but surely they will have at least a couple useful similar items. Just remember that I found all this after only one trip to one shop. For those who happen to be in the neighbourhood, there's a list with addresses of Tom and Co shops here. You can also try and contact a couple individual stores here and here.